17th Edition Amendment 3 comes into force 1st July – Are you ready? 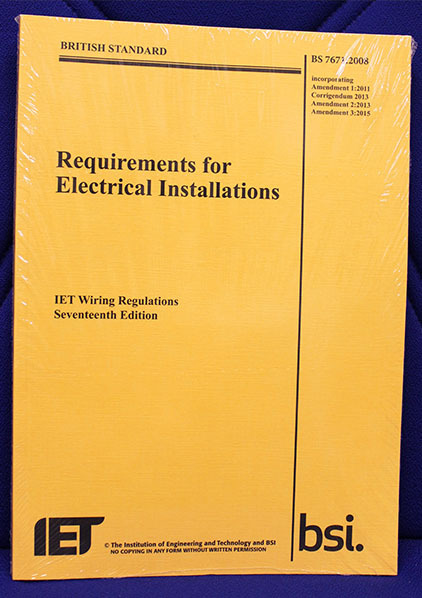 At the beginning of this year (January 2015) the IET published BS 7671:2008, the 3rd amendment to the 17th Edition of the IET wiring regulations. The changes from amendment 3 come into force from the 1st of July (2015) and, although not retrospective, all new installations from that date must comply with the new regulations. Changes to amendment 3 are much more important than amendment 2 and there have been some pretty major changes that electrical installers and contractors need to have an understanding of. Logic4training has updated its 17th edition training course to reflect the updates – to book a place on the updated course or for technical advice call our customer service team on 0345 845 7222. Chapter 41 – Protection against Electric Shock. This has various changes in definitions, as well as alterations for socket outlet RCD protection. For example, ‘Ordinary persons’ in Regulation 411.3.3 has been removed. In addition, RCD protection (Regulation 415.1 for socket outlets up to 20A, and for mobile equipment up to 32A for use outdoors) is now required for all installations – though there is an exception for socket outlets up to 20A for a specific labelled socket outlet, or where a documented risk assessment shows that RCD protection is not necessary. Maximum earth fault loop impedances are revised to take into account the Cmin factor (the minimum voltage factor to take account of voltage variations depending on time and place, changing of transformer taps and other considerations). The maximum earth fault loop impedances given in Tables 41.2- 41.4 and 41.6 have been revised to take account of the Cmin factor given in CLC/TR50480: 2011. Furthermore, the notes to the Tables have been changed for the maximum permitted operating temperature. Domestic consumer units can and do cause domestic fires, and the London Fire Brigade found that fires involving consumer units had increased to typically five incidents every week. Furthermore, BEAMA has said that the main cause of fires in consumer units is loose connections, so it became clear that a change needed to be made to protect consumers from potential harm. To address this, Amendment 3 provides a degree of enhanced fire risk protection, requiring switchgear assemblies (including consumer units) to have their enclosures made from a suitable non-combustible material, or be installed in a cabinet or enclosure made from a suitable non-combustible material. This is covered within Chapter 42 with the addition of Regulation 421.1.201. In effect, this means using steel in most cases. Within this, Section 442 (dealing with protection of low voltage installations against temporary over- voltages due to earth faults in the high voltage system and due to faults in the low voltage system) has been modified. Regulation 442.2.1 has been redrafted and Table 44.2 removed. Compliance with standards requires all equipment to be suitable for the nominal voltage, and also requires certain information to be noted on the electrical installation certificate. Section 512 now refers to the EMC directive and includes requirements for the designer of the fixed installation. Note that minor modifications have been made to Sections 513 and 514. Enhanced fire safety is also referenced in the new Regulation 521.201, which outlines the requirements for wiring systems which are above escape routes, to be supported by fire-resistant fastenings and fixings. All cabling must be supported such that it cannot prematurely collapse when exposed to extreme heat. The new requirements outline the need for cabling to be supported by fire-resistant fastenings and fixings that cannot prematurely collapse under conditions of extreme heat. For this reason, plastic cable clips, non-metallic cable ties and plastic trunking to support wiring systems would likely not comply with the new requirements, which apply to all wiring systems in a building, including those of distribution circuits and final circuits, safety services, and data and communications services. In essence, therefore, wiring systems should be supported in such a way that they will not collapse when affected by fire, especially around escape routes. The sole use of plastic fixings and non-metallic cable ties will no longer comply with the new regulations and rightly so as exposure to fire could result in the melting of trunking and the risk of loose cabling. Installers should, therefore, look for products – cable ties, cable mounts and other supporting components – that meet high standards of fire resistance, as these will be able to withstand high temperatures and provide durability and strength. Stainless steel products are ideal where high strength, reliability and fire resistance are needed. Though many installers will see such stainless steel products as being expensive, they do provide the required support, as well as peace of mind. Also under Chapter 52, the regulations concerning the selection and erection of wiring systems (impact) have been redrafted. Reference to ‘under the supervision of skilled and instructed persons’ has been removed. Additionally, cables concealed in a wall or partition (at a depth of less than 50mm) must be protected by a 30mA RCD for all installations – if other methods of protection, including the use of cables with an earthed metallic covering or mechanical protection, are not used. This applies to a cable in a partition where the construction includes metallic parts other than fixings irrespective of the depth of the cable. However, there is still an exception for cables forming part of a SELV or PELV circuit. Small changes have been made to Regulation 551.7.1 concerning low voltage generating sets. However, there is a new Section 557 covering auxiliary circuits for low voltage electrical installations is. Auxiliary circuits are defined as circuits for the transmission of signals intended for the detection, supervision or control of the functional status of a main circuit such as circuits for control, signalling and measurement. Covered are AC or DC auxiliary circuits, power supplies for auxiliary circuits dependent on the main circuit, auxiliary circuits supplied by an independent source, protection against overcurrent, and wiring systems. Special requirements for auxiliary circuits used for measurement are provided. Note that where specific standards already exist, auxiliary circuits are excluded. Section 559 Luminaires and Lighting Installations – Requirements for outdoor lighting and extra low voltage lighting installations have been moved to new Sections 714 and 715 respectively. A number of changes have been made to the requirements of Sections 559, 714 (Outdoor Lighting installations) and 715 (Extra Low Voltage Lighting Installations). Section 701 – Locations Containing a Bath or a Shower – Regulation 701.411.3.3 now requires all low voltage circuits (including circuits passing through the location) to be RCD protected. Section 704 – Construction and Demolition Site Installations – The earlier exclusion of mining applications in Regulation 704.1.1 is now deleted. Section 711 – Exhibitions, Shows and Stands – Reference to a skilled/competent person has been removed in Regulation 711.55.6. Section 712 – Solar Photovoltaic (PV) Power Supply Systems – This includes minor changes, including to the general schematic. Section 714 – Outdoor Lighting and Section 715 Extra Low Voltage Lighting Installations – A number of changes have been made to the requirements in Sections 714 and 715 – e.g. additional requirements for isolation, switching and control. Section 717 – Mobile or Transportable Units – Regulation 717.551.6 has been added. This does not allow units having different power supply systems and differing earthing systems to be interconnected. Also, changes have been made to the figures showing examples of connections associated with the mobile or transportable unit. In Appendix 1 – British Standards – minor changes. In Appendix 3 – concerning the time/current characteristics of overcurrent protective devices and RCDs – this includes changes in terms of the maximum earth fault loop impedance to take account of the Cmin factor. There are also changes to the Tables in terms of the maximum operating time and current characteristics. In addition, there is a new Table for fuses to BS 88- 2 – fuse system E has been added. In Appendix 4 – The current-carrying capacity and voltage drop for cables includes changes including modifications to Tables 4A3, 4C3, and 4F4A. Reference is made to PD CLC/TR 50480 for calculating circuit impedances, fault currents and other variables. The national annex to PD CLC/TR 50480 is also referred to – this gives calculation methods for cable resistance and reactance – among others. In Appendix 6 – Model forms for certification and reporting – the schedule of inspections for new work only has been replaced by examples of items requiring inspection during initial verifications (which must be appended to the electrical installation certificate). Moreover, some small changes have been made to the electrical installation condition report and associated notes including a requirement to carry out an inspection within an accessible roof space where electrical equipment is present. In Appendix 14 – Measurement of earth fault loop impedance – The equation for earth fault loop impedance has been changed to take account of the Cmin factor.